Quack, quack, quack! It’s time to fill up the bath and stock up on stale bread, you’re going to need it. Here’s how to follow the quacking and search the 10 rubber duckies you need to complete this week’s challenge. Fortnite Season 5 is on the horizon, so you only have until Thursday to complete this challenge. While our plastic feathered friends might be bright yellow, it’s not quite as easy as it sounds to find them. 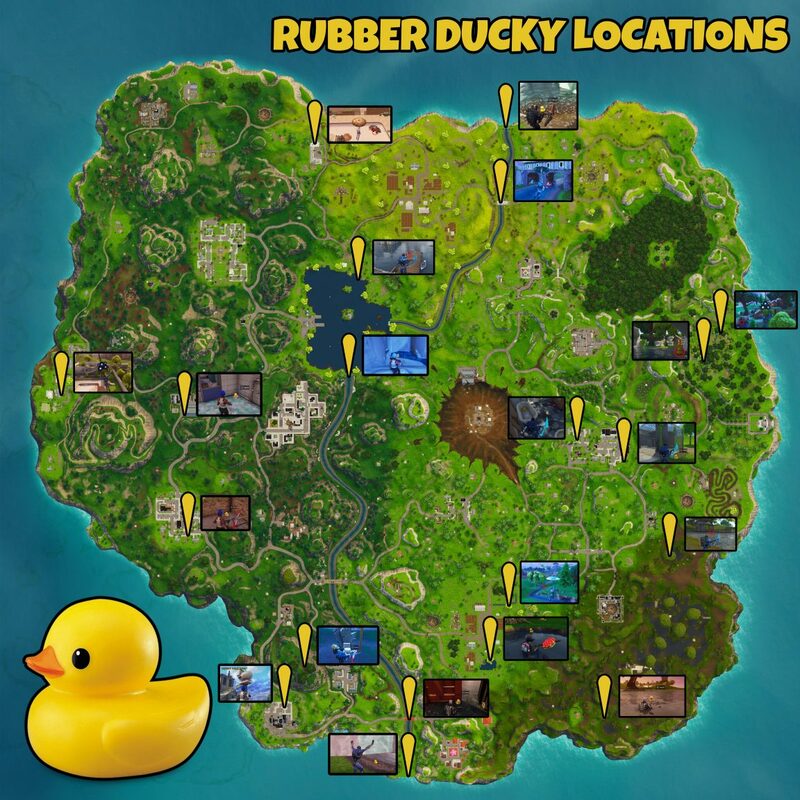 There are many more duckies floating about than you need to find to finish your challenge, we’ll keep updating this page with more locations as we find them. And with more screenshots so they’re easier to spot. First up, let’s take a look at an updated map, then below we’ll go into detail on where to pinpoint the little yellow fellas. 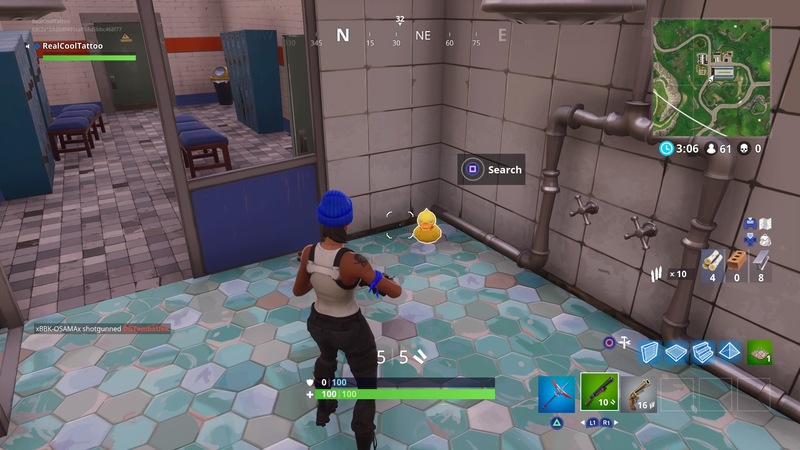 You can find a rubber duckie at Flush Factory under the toilet in front of the main building. 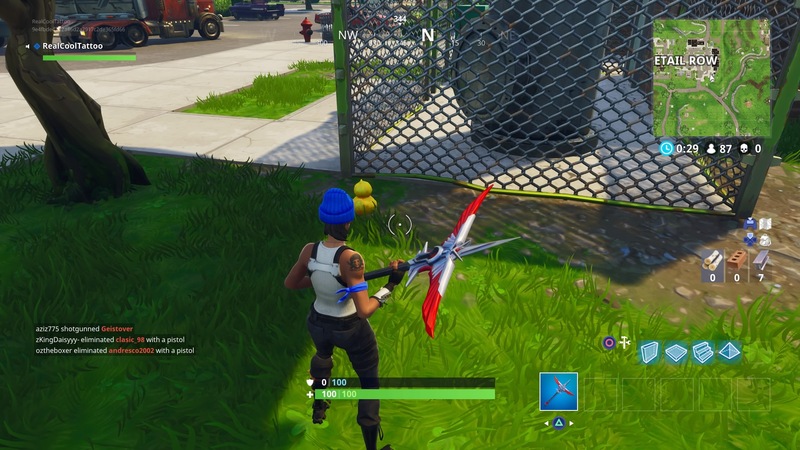 Just break down the pole with your pickaxe and it’s inside. 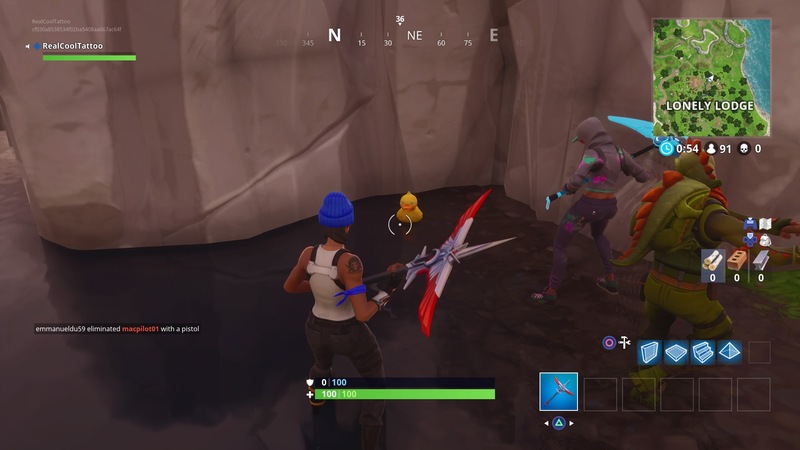 There’s another rubber duckie under the bridge just to the north of Lucky Landing. It should be floating by the upturned ice cream truck. Follow the quacking on the southern side of Greasy Grove and you’ll find a water tank in a small brick enclosure. Destroy the tank and there’s a duck inside. Make your way over to the indoor soccer field north of Greasy Grove and take a look in the showers in the southwest corner of the building. There should be another duckie in there. In the north of the Moisty Mire, close to where it joins onto the road south of Retail Row, there’s a small hut surrounded by water. There’s a duck on the north side of this building. In Lonely Lodge, there’s a small body of water to the north of the location. You should be able to find another duckie on the eastern edge of this water. 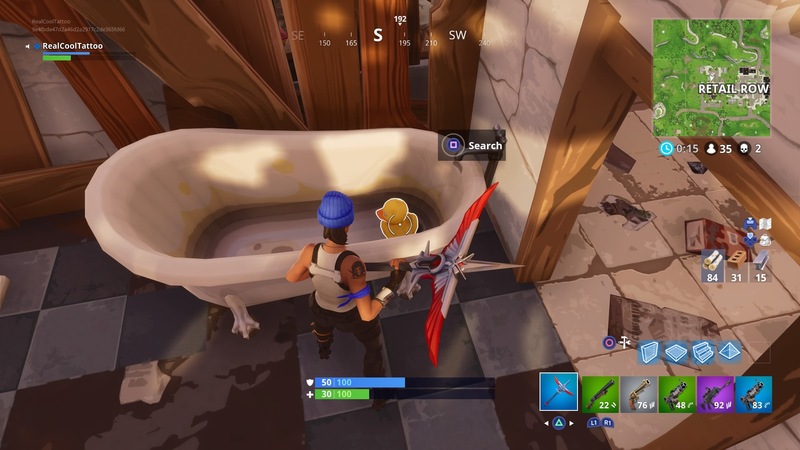 There are two duckies that we’ve found in Retail Row. The first one is under the main water tower in the southeast of the area. It’s not actually inside the tower, but next to a water tank at the southern base of it. 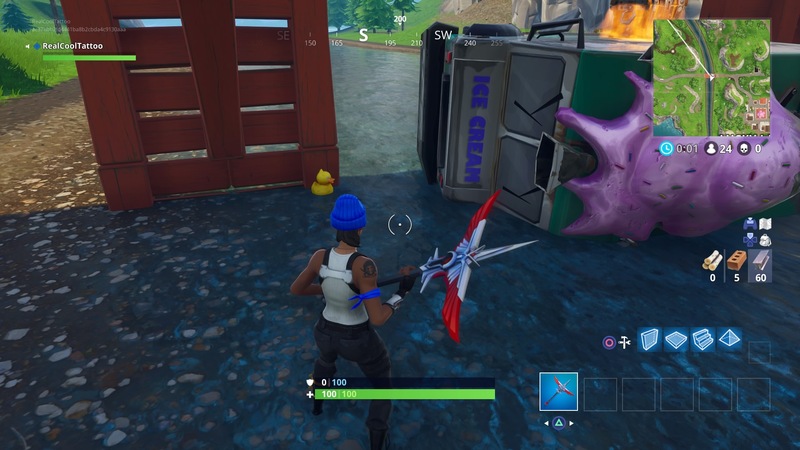 The second Retail Row duckie was in the ruined house with the red car outside. It’s the one in the middle, on the western edge of the location. To get there, head west from the taco shop. The rubber duckie is in the bathroom to the right as you walk in the front door. To the east of Anarchy Acres, there’s a built up wooden bridge with a roof that runs over a river. Underneath the bridge, between some rocks in the stream, is a duckie for your collection. 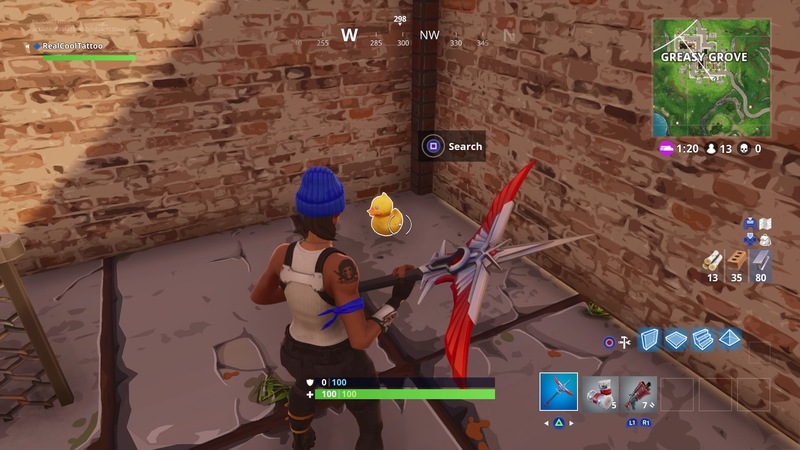 Ducks love water, so it’s no surprise that you can find another duckie on the southern side of Loot Lake, under the waterfall next to Tilted Towers. With Fortnite in the grip of duck fever, the ten above locations might be a little busy. If you land right on them from the Battle Bus then you shouldn’t have any issues, but if you’re running into campers over and over again, here are more duckies that we’ve found. In the extreme north of the island, between map references E1 and E2, there’s a duckie on the bank where the river meets the sea. Between Pleasant Park and Anarchy Acres in the northwest of the map, there’s a leisure centre with an outdoor swimming pool at map reference D2. You can find a duck in the pool. On the northeast side of Loot Lake there’s a jetty. There’s a duck between a boat and the planks you’re walking on. 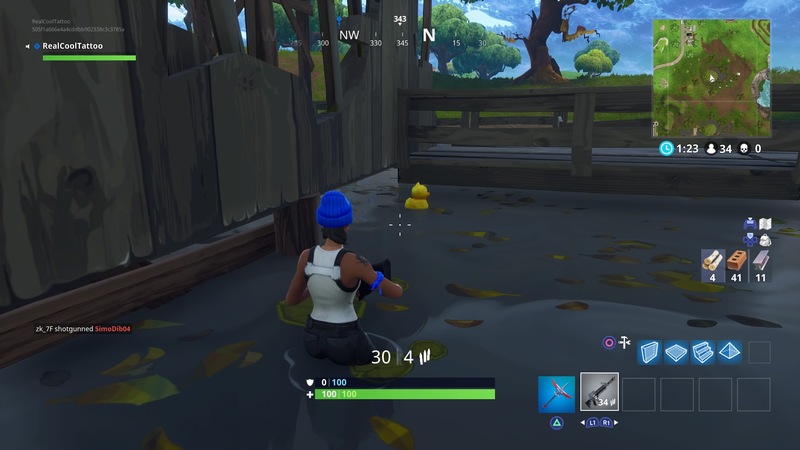 Over in Snobby Shores on map reference A5, you can find a duckie in the swimming pool outside of the second house from the bottom. 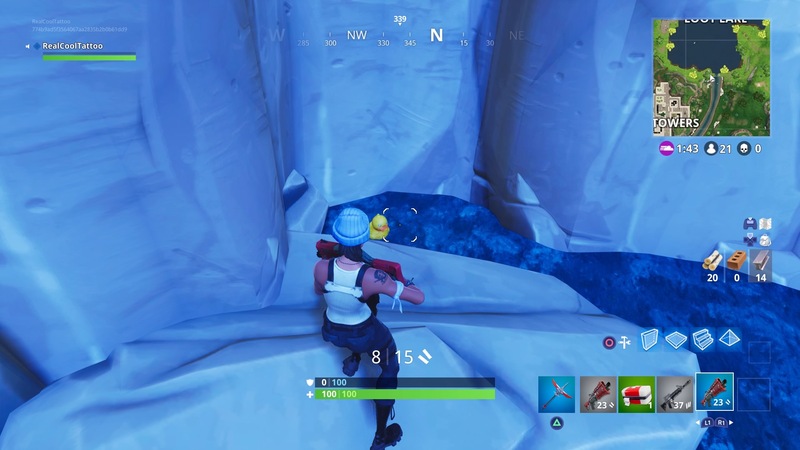 At Lonely Lodge you can find another duck if you follow the river south from where it pools in the north of the area. You’ll see the duck underneath some rocks about two thirds of the way down. 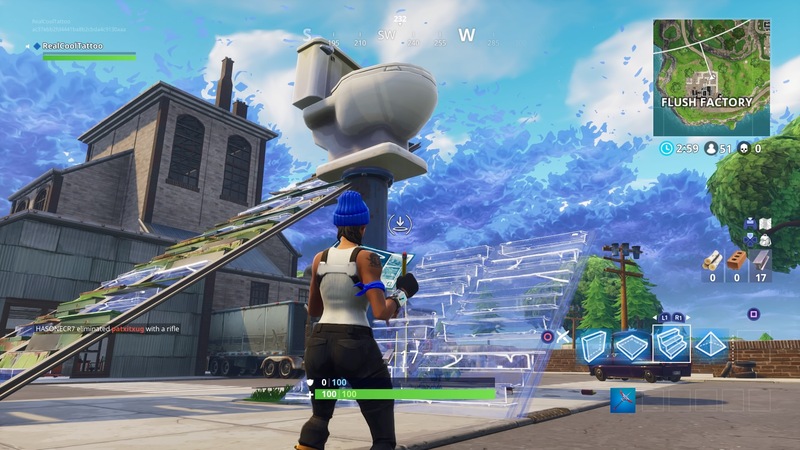 On the hill that overlooks Flush Factory to the north, you’ll find a toilet on the brow. Break and search the toilet to find a duck. In the northeast of Fatal Fields there’s an L-shaped stream. Underneath the overhanging tree on the longest part of the stream you’ll find a rubber duck. On the south side of Fatal Fields you’ll find a pond. You’ll find a duck under the tree on the north side of the body of water. 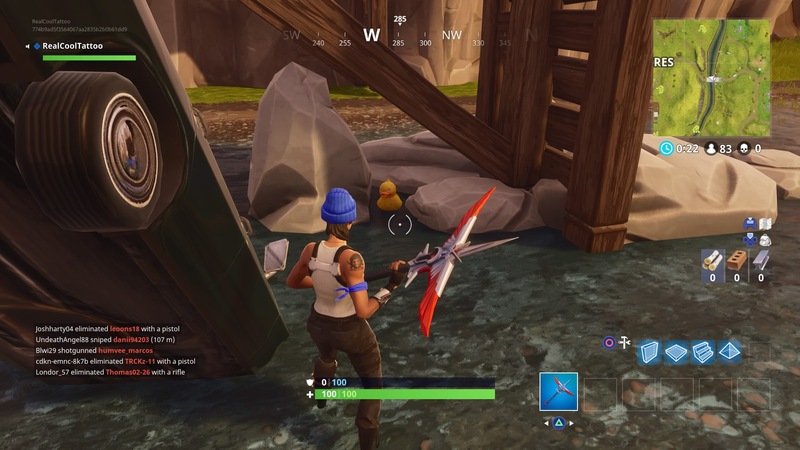 In the extreme south of the map, there’s a duck on the bank where the river meets the sea west of Lucky Landing. Due south of the Prison to west of Moisty Mire at map reference H9, there’s a duck in the last pond before you reach the sea. It’s that time of the week again! The Fortnite Season 4 Week 3 challenges have dropped, so get hunting and earn those Battle Stars. If you need a hand finding the Salty Springs treasure map location, we’ve got you covered with our guide. And of course once you’ve bagged all seven of the weekly challenges, you’ll be able to grab the Blockbuster Looming Threat Challenge. It’s good to get these challenges out of the way early. Not only they contribute to your level and Battle Pass tier, but if you complete every challenge each week you earn another upgrade piece for the Omega skin as well.